No one knows you better than a sister—your dreams, your fears, your mistakes, and all your secrets. It was just that way when Jess and her older sister, Emily, were children. Born barely a year apart, they were deeply entwined, complementing each other in their differences. When Jess felt awkward and shy, Emily, the consummate big sister, was happy to take the lead. Jess is in shock, unable to remember what happened. Emily, traumatized, watches helplessly as her life unravels. But as the search intensifies and the police detective’s questions grow more pointed, a different picture emerges. Behind the image of a seemingly happy family—Daisy’s doting teenage sister, Chloe, loving father and husband, James, and siblings Emily and Jess—there are devastating deceptions and long-ago choices that can never be unmade. And underlying everything is the story of what really happened to drive Emily and Jess apart years ago. Unfolding through shifting perspectives, Little Sister is a brilliantly plotted, dark, and constantly surprising tale of love, rivalry, and broken loyalty that reveals how far one sister might go to protect—or destroy—another . 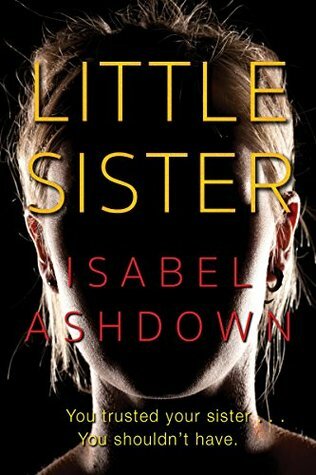 . .
Little Sister by Isabel Ashdown is a psychological thriller that had me turning the pages as quickly as I could to find out just what would happen. With a missing child on the line it was safe to say this one would hook me into the story and not let go but also full of shifty characters and a fast paced plot it was extremely addictive. Jess and Emily are sisters that were close growing up being barely a year apart in age. But the old the pair got the further they began to drift apart and then had a huge falling out that separated them for years. Now Jess and Emily have reconciled as adults and have grown close once again with Jess taking up Emily’s offer of moving in with Emily and her husband to help with their children. On New Year’s Eve Jess stayed home to watch little Daisy as Emily, her husband and teenage stepdaughter went out to celebrate but when everyone returned they find Jess passed out and Daisy gone beginning a frantic search for the missing child. The story in Little Sister is told with alternating points of view between the sister, Jess and Emily through the first half of the book at which point another POV is added into the mix. Things mostly follow along in the current time but there are flashes in the story to develop the past between Jess and Emily to dive deeper into their relationship. Little Sister was just what I hoped for when picking this one up, a nice trip through the secrets and lies to find just how deep the betrayal would run in this family. A nice little twisty ride that has a reader questioning everyone along the way with a bit of nail biting tension building to the final conclusion. I’d definitely recommend this one to the fans of psychological thrillers. Well, hopefully they’ll approve me. So tempted – but I’ve just had more added . . . . not sure I can resist! I’m so happy to see that you like this one. Was just looking at this one today. Looks like another one I’m going to read! Great review! Glad this was everything you hoped it would be! Awesome review! This sounds really good. Time to head over to request this one. Promise to myself broken again. You and your good reviews Carrie. LOL! Sorry! If it makes you feel any better though I was right and Kensington added a ton which means more added to my list yet again. I know, you called it. I requested 13 of them. I am so bad. I dropped this week because of that. Time to do a marathon. Yes, I think tomorrow is a good day to do nothing but read.